All of the HEPA based air filtration systems are also available as OA or Odor Absorption units. 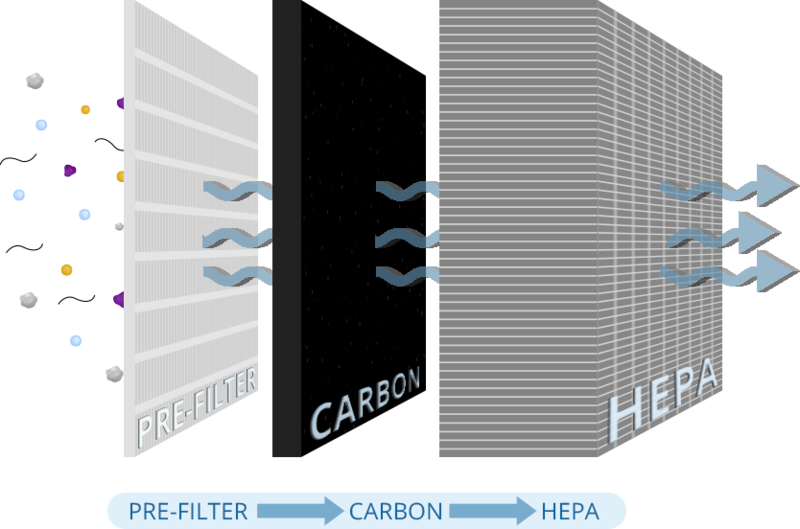 Uses all activated carbon or other absorptive medias in-lieu of the HEPA filter. For use in eliminating a wide variety of gases and odors. Depending upon the system and configuration you can have up to 60 lbs of carbon or other absorptive medias in the units. All of the HEPA based air filtration systems offered by Pure Air Systems are also available as OA or Odor Absorption units. These systems incorporate all carbon or other absorptive medias ( alumina, potassium permanganate, zeolite and specially treated carbons) in-lieu of the HEPA filter. Depending upon the system and configuration you can have up to 60 lbs of carbon or other absorptive medias in the units. For many applications the reduction and or removal of a specific gas or odor is the primary issue. With enough specific information about the application Pure Air Systems can design an OA unit that will reduce the PPM levels of the specific gas to a required amount. The ability to combine the all carbon units with the variable speed ECM motors allows for finite air flow control ( CFM ) of the specific gas through the carbon to obtain best adsorption rate and maximize single pass removal efficiency. In the past three decades Pure Air Systems has used its systems to remove gases from Acetone to Toluene and everything in between. We have also removed organic and inorganic solvents and all types of odors from a wide variety of sources. 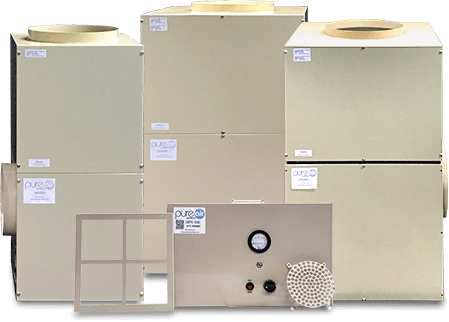 The ability to modify one of our HEPA based systems to an Odor Adsorption system in the field makes the Pure Air Systems product line unique in the industry. Simply by removing the HEPA filter and replacing with the selected adsorption packs the HS unit can easily be converted to an OA unit in the field in a matter of minutes. And with the larger 1200HS and 2000HS “S” versions, you have the ability to have the HEPA and up to 30 lbs of adsorptive media in one unit for applications where both fine particulate and a specific gas or odor are the issue. Call the number of fill out the form below to connect with our team of specialists. Want to learn more about air filtration? Take some time to browse through our FREE mini course.